HAVE YOUNGER COOKS LOST THAT HUNGER TO LEARN? It is a question that is far more complex than it seems on the surface, yet it is a question that has been posed to me many times. Each generation seems to question the next generations’ commitment and in doing so compare this new generation to their own. This is not an isolated comparison used in the restaurant business, but since this blog is dedicated to those who prepare and serve food, this is the example used. Time and time again chefs point fingers at the new generation of cooks while shaking their heads with a bit of condescending dismay. Chefs have a tendency to generalize based on their own experience with staff and paint with a wide brush stroke claiming that “This generation does not have the right work ethic.” Whether this is true or not seems to be something that needs investigation. The real issue is that chefs are finding it very difficult to operate as they have in the past. When this occurs in any industry there is always a need to find something or someone to blame. The restaurant industry of Escoffier, Bocuse, Keller, Tower, and Marco Pierre White is not the same today. We (the food industry) are moving through a pretty significant paradigm shift and those who have called the business their home for decades can either jump on board the shift and figure out how to adapt, or continue to plant their feet firmly in the ground and resist. Whom do we think will win? The restaurant business is, and always will be, a business of people serving people. It is the people of a restaurant who will make a difference, define the brand of a restaurant, and create memorable experiences worth a guests’ investment. When a business this dependent on strong, competent, dedicated, caring people finds it challenging to find and retain these folks, then there is a need for great concern. The Chef’s Perspective: The majority of chefs that I talk with are convinced that the younger generation of cooks no longer view their work as a calling that requires total dedication to ingredients, process, expression, and service, but rather a job that involves something that they are able to do and that generates a paycheck. The Cook’s Perspective: Many young cooks that I talk with feel just as passionate about food as their mentor, but do not view their position as all-consuming. They feel that they can give 100% while they are on the job as scheduled, but insist on a life after work. WHERE IS THE THIRST TO LEARN? The Chef’s Perspective: The majority of chefs that I talk with are convinced that younger cooks no longer crave constant additional knowledge about different aspects of cooking, working with new ingredients, discovering and building new skills, and dedicating the time to accomplish this. Chefs reflect back on their own commitment to working “off the clock” to build their repertoire and discover new skills and methods. The Cook’s Perspective: The younger cooks that I talk to are interested in building their base of skills, but do not see this as a personal responsibility, but rather something that equally benefits the restaurant as well as themselves. To this end, they fail to see the rationale for learning on their own time. They feel that “pay for time” is a right and know that the law backs them up on this assumption. WHERE IS THE SINGLE FOCUS? The Chef’s Perspective: Career chefs that I talk to have dedicated their lives to the kitchen and the pursuit of excellence. They sacrifice a great deal to be able to reach this goal and view their work as their first responsibility. Everything else in their lives takes a back seat – this is, after all, the way it is done. These chefs are puzzled by younger cooks who do not view their career in the same, single focus way. The Cook’s Perspective: Younger cooks view their lives as comprised of multiple focus points: career, family, friendship, hobbies, and causes to believe in. Career is very important to this younger brigade of cooks, but not more important than the balance that makes them feel whole. The Chef’s Perspective: Chefs with whom I talk are convinced that younger cooks are not dedicated to the craft, the restaurant, and the team. They site instances where cooks call out when they are sick, request personal time for family events, balk at working six days, turn down those calls to come in to work on a day off because business is stronger than expected, and fail to understand why the chef believes that the restaurant must come first. The Cook’s Perspective: The cooks with whom I talk reflect back to the need for balance in their lives and state that when a schedule is made they plan their lives around it and cannot simply drop their plans because the restaurant is in need. They also feel that the old adage that cooks never call in sick is outdated and dangerous to others. The Chef’s Perspective: There is no question that “Yes Chef” is appropriate in the kitchen and serves to keep order when potential chaos surrounds cooks and chefs every day. Chefs oftentimes feel that this subservience is parallel to respect for the chain of command and the responsibilities that fall on the shoulders of the person in charge. Chefs that I talk to are convinced that “Yes chef” no matter what the request or demand is essential for a kitchen to operate efficiently. The Cook’s Perspective: Younger cooks are less likely to bow to the demands of the chef and feel that they should have the right to question at times. They appreciate the need for chain of command, especially during the heat of service battle, but are less likely to follow directives without question when time and situations allow this to occur. WHERE IS THE UNRELENTING DRIVE? The Chef’s Perspective: Chefs that I talk to carry the scars of battle, feel the daily pain of overworked muscles, strained backs, swollen ankles, and burns and cuts that were put aside and not attended to because the business didn’t stop. This is a chef’s badge of honor and chefs feel that if they suffered through these challenges then every young cook should do the same. 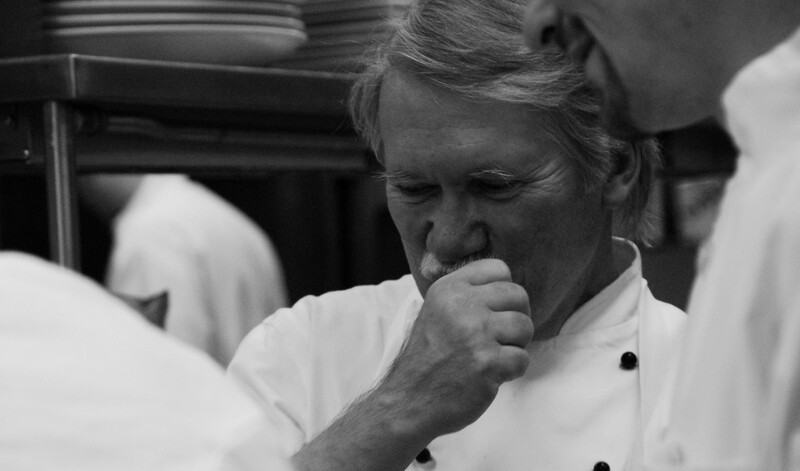 The business demands relentless drive and commitment – the cook must work through the pain. The Chef’s Perspective: The chefs that I talk with were typically raised with the old school belief in respecting traditions, following in the footsteps of great chefs who came before them, and being the personification of the proper leader that they envision. This involves uniform, grooming, methods of cooking, dedication to service, and respect for “The way things are done.” These chefs cannot imagine anyone stepping outside of this professionalism mandate and view anyone who does as a rebel not worthy of working in their kitchen. The Cook’s Perspective: Young people are more inclined to challenge the norm. Good, bad, or indifferent, history has been on the side of those who challenge the way things are done and the assumptions that people carry because of tradition. Challenges to uniform, tattoos, adaptation of radical cooking methods, stepping outside accepted flavor profiles, and viewing some traditional kitchen systems as antiquated and cumbersome, are the new norm for younger cooks. WHY AREN’T YOUNG COOKS MORE PATIENT? The Cook’s Perspective: Young cooks should not worry so much about pay scales and benefits. They must prove themselves first, build character as a strong advocate for kitchen life, and accept the way things are. Once they pay their dues, the money and benefits will be within their reach. The Cook’s Perspective: I have bills to pay, college loans to pay, maybe a family to support, a need to address health concerns, and a desire to find some paid time such as vacations and personal days just like anyone else in a different field. I can’t afford to be patient. Do not view this comparison as an endorsement of young cooks resistance and the rebellious approach that some may take. I am, after all, a product of tradition and have always respected the old, established ways of operating in a kitchen. The fact remains that the people within that environment are changing and we (chefs and restaurateurs) must pay attention, figure out how to adapt, listen and be willing to create a new norm, and determine how to thrive in an environment where cooks priorities are different than ours. What is the alternative? As every restaurant seems to lament at how challenging it is to attract and retain cooks, we must look to the need for change. I happen to sit in both camps. At 34 years old, I have the old school mentality that a formal chain of command is absolutely necessary for any restaurant, but I work with people who have tossed that notion out with the spent fry grease. It’s a bit maddening. As a 31 year old workingu since age 14, I agree wholeheartedly. I can spot the difference very quickly between one who “does” and one who “is”. I would rather be next to a body willing to take direction with respect for the art & passion than a culinary degree-toting 20 yr old who believes he walks into the kitchen a “chef”. Trust me, you’ll now when you’ve earned it. Young grasshoppers I urge you to be patient, remain teachable, and you may survive.. I continually learveu my personal view of culinary school at the college level is that it should be used after a person has been n the biz for some time and wants build on the foundation they already have. This may be my favorite piece so far 🙂 culinarycuesblog, perfection.